I have to share this here justin case you have not seen this on my main blog. This is my 5th Photobook that I ordered from ARTSCOW and I was of course contented with the result of it. 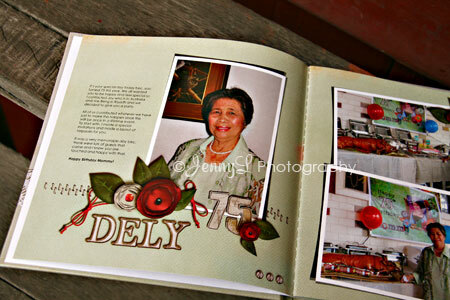 This photobook was about my mom's 75th Birthday last 2007 and it's only now that I had a chance to scrap it. 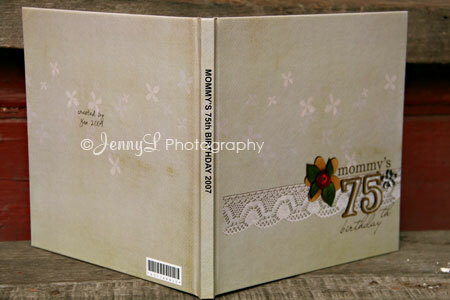 It's 24 pages 8" x 8" Photobook that I made using Photoshop CS3. It was kidna easy for me to finish it since I used a phot template form simplyyin.blogspot.com and I just added some elemets and papers. Just in case you don't know how to use photoshop, you can still make a photobook because ARTSCOW have kits or designs that you can use. WOW nice nmn ng photobook mo...I always wanted to learn how to make good photos..but I still need that big camera first hehehe..maybe next year I get it from husband. very nice one, T Jen. wish you can post page by page para makakita rin kami wherever we are. :) for sure your mom will be very happy of that. hi JES---- yeah pang 5th pa lang yan kasi natigil yung ibang mga nileleyout ko.... kaya pang 5th lang kasi I layout all of them sa photoshop eh maedyo matagal din yon.. at saka busy pa ko with online and offline works..